Happy Black Friday! I hope those that do Thanksgiving enjoyed it and had much to be thankful for. 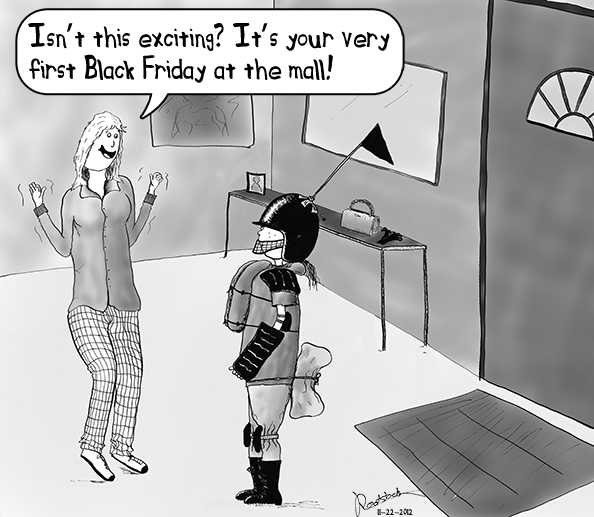 Since it’s a holiday weekend for many IBMP readers, I thought I’d keep it simple today and give you a new cartoon in honor of Black Friday–the holiday that manages, in one day, to achieve a level of consumerism that Christmas needs 12 days to accomplish. I’ve got a lot to be thankful for–including the many readers of I’ve Become My Parents. So if you’re out there braving the crowds and spending $2,000 so you can save $75.00, hanging with the family digesting the prior night’s meal, or hiding from the family and reading blogs in the closet, thanks for popping by! I'm Canadian so we don't have Black Friday here officially (although some of stores are trying to do Black Friday sales to convinvce Canadians not to cross the border)…but in a way I'm kinda glad. Boxing Day is enough for me as is! P.S. For the longest time, I thought you were Canadian too (given your FB post about Toronto)! I’m a US citizen, Canadian permanent resident. It’s perfect–I get to vote for President without suffering through all the pre-election BS! The flag on the helmet is genius. Why didn’t I think of doing that? It was between a flag or a flashing siren light. To be honest, I couldn’t figure out how to draw the light so people could tell what it was. It’s a flag of convenience. Hope you’re surviving the day! Being Aussie, Thanksgiving (and the subsequent shopping madness) means little to me.